These weeks are just flying by. Hard to believe that this week the kids in our area go back to school. Where has the summer gone? I hope everyone is having a fun and safe Labor Day weekend. Our plans consist of me staying in my craft room. It's my favorite part of Sunday, Sunday Scrappin time. It's a terrific group, come over and join us. Last weeks challenge was to create something with texture. 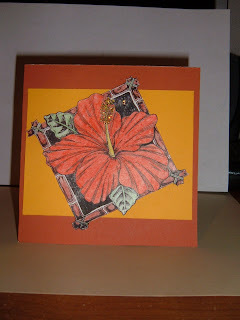 I made several cards this past week using my cuttlebug embossing folders. The past few weeks I have gotten so much out of my cuttlebug, I love that thing. 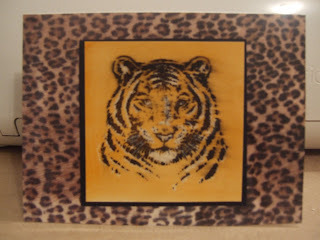 It makes embossing so much easier and I love the look. Next week's challenge is to dig out an unopened embellishment that you have in your stash and actually USE IT! We all tend to hoard the little things that we pick up.... c'mon, you know you do... so let's dig them out and put them to good use this week. This will be an easy challenge I have tons of things in my stash never openend the question is what one do I use. These cards are the second half of the challenges that are being done through the new group I recnetly joined over at SCS called WishRak. The cards made this weekend are being sent to our troops overseas to send back home. The next 2 cards the challenge was to make a Female Birthday card for the troops to send back home to a special lady. The image I received from the another member of the WishRak group (house mouse gruffies). I changed the colors to make them different. One I'm going to keep because I always need birthday cards and the other I will send to the troops. The second half of the challenge was to use a color combo that has been hosted on SCS I choice CC141 Pretty in Pink (which my pink is a little different it is not the SU brand and Wild Wasabi and white). 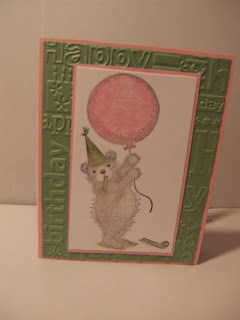 Both cards I ran through the cuttlebug using the Happy Birthday embossing folder. Thanks for looking. I'll have more to post tomorrow. Have a safe and fun Labor Day weekend! I recently joined the WishRak group on SCS. This weekend they are holding a Labor Day card challenge. Every hour a new challenge is given and you have to complete a card with that theme. The best part is the cards we are making are going to be sent to our troops in various hospitals. The first two cards are for the Fall/Autumntheme challenge. I love fall, it's my favorite time of year. 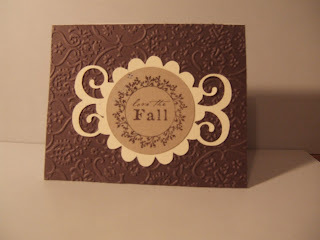 For the first card I ran it through the cuttlebug using the pumpkin harvest embossing folder. 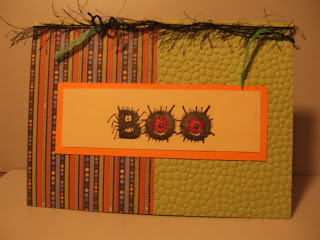 I ran this card through the cuttlebug using the textile embossing folder. The image is from Joann's dollar bin. 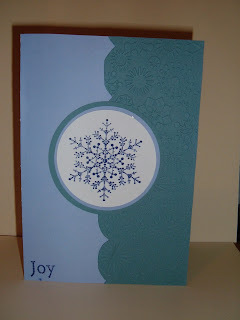 The scallop swirly die cut was cut using the cricut Storybook Cartridge. This one is for the Let It Snow Let it Snow challenge. The challenge was to use a snow theme with the colors blue and white. I'm actually pleased with this one, I may make these for my actual christmas cards this year, not sure yet though. Hard to believe it's time to start thinking of christmas cards already. Wow! Miss you/Love you Themed challenge. I love the color combo pink and brown. The image is from SU Pun Fun set. Thanks for looking there are about a dozen challenges going on today that I need to start on. I'll be back later with more cards. I have became good friends through email and blogging with Forgetfulone. She is such a sweet loving person. I must add I am happy to know someone who is going back to work tomorrow (Monday) besides just me. LOL! Forgetfulone is a teacher and her summer break is over, back to the kids and books tomorrow for her. She was so kind to leave me this sweet award. Thank you so much Forgetfulone. Where did this week go? It flew by, I have to return back to work tomorrow. But on the bright side this coming weekend is a 3 day weekend and in less then 3 weeks I will be on vacation again. Have you gone over and checked out Sunday Scrappin yet? If not what are you waiting for its a great group of crafters over there. Come on join us! MOST OF MY CARDS ABOVE USED LAST WEEKS SUNDAY SCRAPPIN CHALLENGE OF USING SQUARES. I AM A VERY SQUARE CRAFTER. LOL! *I didn't scrap as much as I would liked to this past week but I did get a lot of cards done. *I recently joined a RAK (Random Act of Kindness) group on SCS and my goal is to send out a birthday card a week to the other participants starting in Sept. This weeks Sunday Scrappin challenge is add some texture to your project. 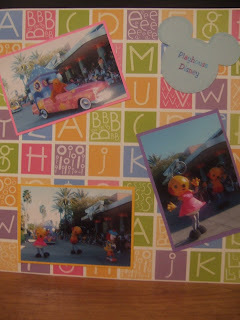 Use textured scrapbook paper, sand paper, paint... whatever you can think of! OOOH I can play with the fun flock some more. 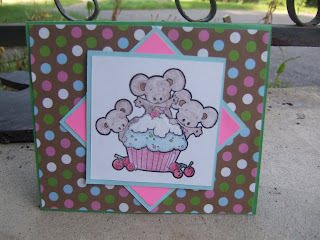 I used Fun flock for the first time on my Cupcake Mice card and I love the stuff and it is easy to use and dries fast. To all my faithful readers I do apologize as I have failed not only myself but all of you. On June 28 I posted my pledge (can be viewed here) that I will not buy any more paper the rest of the summer instead I will use huge stash I already have. On our way back from Lake George on Thurs. we stopped into Joann's with the intention of getting 2 sheets of 12x12 Red Cardstock (being that I have none and I have a page idea). Once I got to the paper aisle there were sides everyone stating 6 sheets of paper for $.98. What is a girl to do but stock up. I forgot about my pledge and I went crazy. But I only bought $4 and change worth the stuff that is paper and 2 $1.00 stamps, so it's not that bad. I did go almost 2 months though, please you must sympathize with me, someone, anyone. 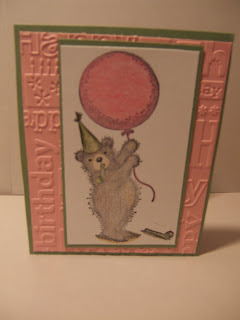 I made this card for this week's Taylored Expressions Cupcake (Sketch) Challenge (There is still time to join you have until 8 pm PST on Monday to upload your creation - and you don't have to use a cupcake theme). The image is another one of the stamps that I purchased from Rubbernecker Stamps, image is called Little Lovin's Cupcake Mice. Pattern paper is from the DCWV Everyday paper Pack. I used fun flock on the top part of the cupcake (the white part). This was my first time using fun flock (it gives it a soft fluffy look) and I love the stuff and it is so easy to use (I ordered mine through TAC but you can get fun flock at several online stores - I know my local craft chains don't carry fun flock). I recently joined a RAK (random act of kindness) group over at SCS so I have to make several birthday cards, my goal is to send a birthday card a week starting in Sept. to the various people in the group. Remember you can always click on the picture to make it bigger. Have I told you I LOVE TAC (The Angel Company) and I LOVE my Angel (aka Demo)! 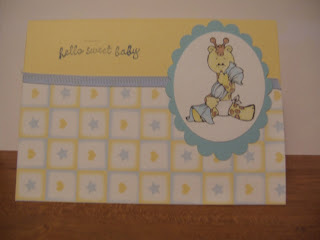 This card was made using the Hello Baby Stamp set from TAC. That little giraffe is the cutest thing ever. I was going through my paper looking for something for another project when I came across this pattern paper and knew I had to make a baby card. I don't know anyone having a boy, everyone that I know that is pregnant is having a girl but I couldn't resist I had to. I'm sure one day I will have a purpose for this card. LOL! Another thing I'm loving is the cricut StoryBook Cartridge. I love the fact that it has scalloped shapes on it (I know your sick of hearing about my love for this cartridge and TAC - but this is a serious love affair I am having here). I created another blog this evening for just my pictures. It has no specific theme to it, it is just of pictures that I take that I think are worth sharing. I wanted to keep my crafts (cards and layouts) separate so no one gets bored with the picture picture posts. If your interested check out my other blog at http://theworldthroughchrissyslens.blogspot.com/. I will be uploading more pictures to that. I take so many pictures that I figured they needed a blog of their own. I mean just in the little day trip we went on today we took over 400 pictures, so I'm sure you'll agree they need a home too. This bird is just the prettiest! The paws on this cat was huge and she looked like she was ready to attack. 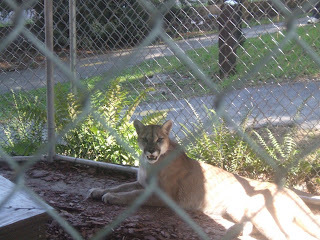 She got up walked over near us (thankfully she was in a big cage and couldn't get us LOL). and she let out this meow I kid you not it was a meow that your household cat would make it was so low and so petite Jeff and I were laughing. We weren't expecting that at all from her. This little monkey is the cutest little thing. We watched him for awhile. 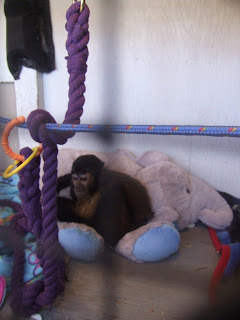 He was so cute he was snuggling he little teddy bear he had in the cage with him. 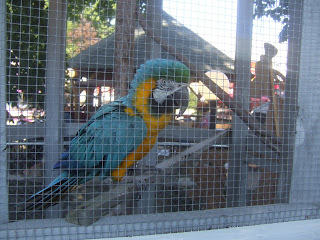 It was hard to get good pictures of him because of the cage. I wanted to take him home. I was going to go watch tv my arm/wrist have been hurting from carpel tunnel but I had this card idea I just had to do. LOL! We all know that feeling. I have been organizing my stamps so that I know what I have. I had them in several different combine them all together (Christmas, baby, drawers and I decided it would be easier to Halloween/Fall etc. in their own drawers). 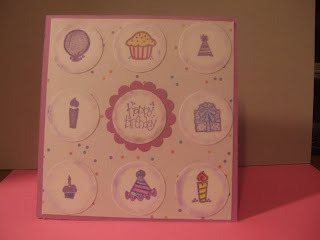 I came across these cute birthday stamps that I had (forgot about them) and I knew they would be perfect for the Taylored Expressions Cupcake Challenge. This card will also fit for this weeks Sunday Scrappin Challenge (Hip to be sqaure - make a square card or use squares on a layout). I also wonder if this will work for the Stamps, Scraps n more challenge (to use polka dots) the pattern paper has polka dots on it. I used the SU 1 3/8 circle punch for the circles and SU Scallop punch. I chalked around the images because they kind of blended in with the white pattern paper. I like this card layout there are so many different uses for it. I have a tool (hammer, saw etc) stamp set that would be great for a masculine card idea. The ideas are endless. 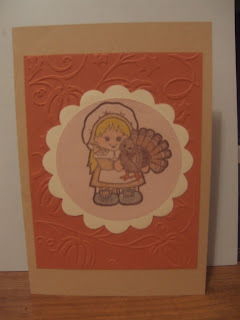 This cute little pilgrim girl is another one of the stamps that I ordered from RubberNeck Stamps. I also purchased the boy pilgrim but haven't done anything with him yet. 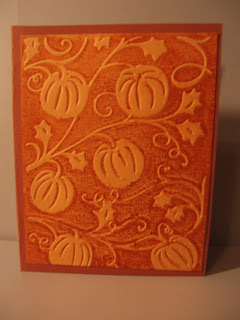 The orange color cardstock I ran through the cuttlebug with the pumpkin harvest embossing folder. The scallop and circle were cut out with the Cricut StoryBook cartridge (love that cartridge for many reasons but mainly because it has scalloped shapes on it). I'm finally getting back to working on my Disney album. Jeff and I are talking about going back to Disney hopefully next year if we can get some of our debt paid down. I want to get my 2006 album done before we go back, I still have a lot to do. This page is from the MGM Stars & Motor Cars parade. The pattern is from Nana's Kids paper pack. I missed Sunday Scrappin last week. There just was enough time to do the Sunday Scrappin post I had to start on the invitation order that I received. I missed Amy (the fabulous host over there) and all the other wonderful ladies that always participate. This weeks challenge is to be hip to be square. Use squares as the main focus of your project... will it be a square card? A scrapbook layout with lots of squares? A square altered item. This will be an easy challenge I am a square person. LOL! I recently was introduced to TAC (The Angel Company) and I love their stamps and the demo that I have is awesome (Tina aka Gadget Girl). 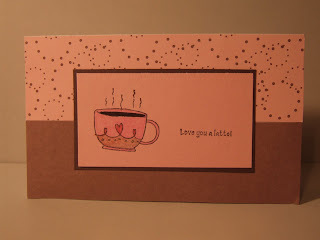 For this card I used this week sketch at I heart 2 Stamp. As soon as I saw the sketch I knew I had to use my new ice cream stamp set, this little girl is so cute. The pattern Paper is from DCWV Summer Paper Pack. 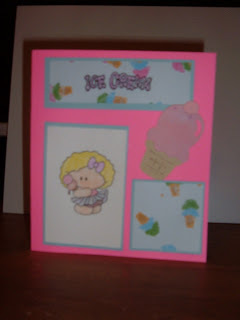 The ice cream die cut was cut using the cricut doodlecharms cartridge. My sweet friend Melanie tagged me. You have to check out Melanie's blog, she always uses the right words and picutres on her blog. She's amazing!! 5) Let each person know they have been tagged and leave a comment on their blog. 1. Next week I am on vacation!!! YEAH NO WORK!!!!! We don't really have any plans except for one day were going to the fair. Other then that we are sleeping in and staying up late in the craft room!!! 2. Jeff & Sister say I'm a "dork" at times. 5. Speaking of payless. I went into the store looking for sneakers so I had a decent pair when we went to the fair (fair = new sneakers). I tried on a few didn't like them (liked them style wise but not on my feet) then I tried this one pair and they were comfy, I didn't want to take them off that's how comfortable. I put my sandals in the shoe box and went to the clerk and said "Do I have to take these comfy shoes off" she laughed and said no and added me a pair of scissors to cut the tag off. Jeff just shook his head and chuckled. 6. I recently purchased a green ipod and according to the ipod it has 2 days of listening music on it. LOL! I bought it so that I could drown out my co-workers at work. It works wonders! Every job with aggravating co-workers should come with an Ipod. I have to tag 6 other people. Right now my brain is fried. If you want to play along please leave a message here for me to check it out. In the middle of the week my order from RubberNecker Stamps arrived and I couldn't resist I had to take time out from making invites and make a card with at least one of my new stamps. I love this flower. You can leave it as is or you can even cut out the flower and use it alone. The options are endless. Of course I had to stickle part of the flower seeds. Tomorrow is my last day of work for a week and I can't wait to play with the rest of my new stamps. I have a few other things that I ordered from other companies that I can't wait for them to arrive so I can play. Jeff treated me to a shopping spree last weekend, and boy did I go shopping. LOL! There maybe very little activity going on around here lately but there will be a lot of creating still going on. I have my first paid order that I have to make. A girl at worked asked me to make birthday invitations for her daughters 1st birthday. So that night I came home and whipped up a quick invite and she loved it and asked for 25 of them. 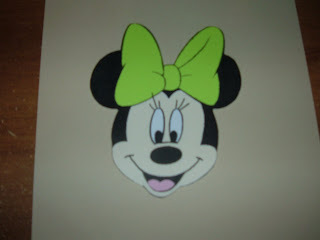 They are a paper piecing of minnie mouse's head and the invite is on the back (I gave her the sample that I made and forgot to take a picture but I will have many more to post). Then she asked for be to make some party decorations. I have to have these all done within 2 weeks. So if it's quiet around here I do apologize. 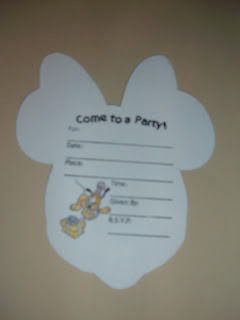 I am very excited to be asked to make these invitations and more excited to be paid for it. Off to start cutting minnie head's out. LOL! We are calling all Paper Crafters (Cardmakers, Scrapbookers of all kind) to come and join us at Sunday Scrappin. It's a fantastic group where you post your weeks goals and last weeks Ta Da's and you also have the option to take part in that weeks challenge. There is no pressure if you don't get to complete the challenge or your goals. It's a friendly group so come on over. It was a stressful week at work so I didn't get much done but I did get a few cards done yesterday (Saturday) thanks to it being a wash out it rained most of the day. 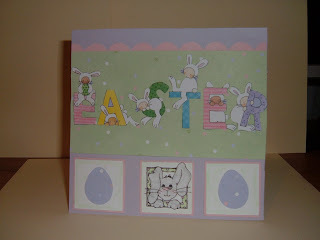 I made 1 Easter Card, 2 Christmas Cards, and my nieces birthday card (click on the link it will take you to all of the cards they are posted in one thread). I want to continue taking part in the various blog challenges. Challenge: I didn't take part in the challenge last week, not due to lack of pictures I have plenty of the dog in the yard or cookouts etc. I was just drained and no energy. This weeks challenge is do something food-related. Scrap your favorite recipe, make a card with a watermelon theme.... be creative! Argh I don't cook not that I don't like to I just can't. Laugh I'm serious. My mother tried teaching me and I would say "NO Mommy, I will marry a man that could cook". And my dad would get mad and say "My daughter isn't going to depend on do man, especially for eating". Let me just say I come from a part Italian family that loves to eat. LOL! So the enrolled me in Home Economics class at school (at that time it was an option now its mandatory) and I refused to cook I always found some poor boy in there to cook for me. And I did I found a man that cooks and cooks well. So a recipe page is out of the question for me. LOL! I guess I will have to get creative on this one. LOL! Your probably thinking Easter is this girl nuts it's only August. LOL! When I saw the sketch at Sketch Saturday I instantly got this card idea. The bunny image in the bottom middle is from a TAC stamp set that was kindly sent to me by Tina (Tina I will be placing an order with you soon - Love the stamps). The eggs are from Cricut Doodlecharms. The word Easter was on paper that I bought from the dollar store and I cut them out to fit on my card better (they were to spread out on the original paper). I know I go from Easter to winter/Christmas. But hey when you get a card idea you have to run with it. This sketch is from this weeks Our Creative Corner challenge. I was having a difficult time getting the "wave" just right so I went with a more "wavier" look. Over all I'm pleased with the card with the exception of the bottom left corner I dabbed ink on it in error and if I cut it off I will have to cut the word Joy off and the card wouldn't look right. It gives it that personal touch I guess. Grrrrrrr. 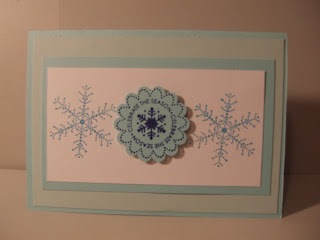 The right side of the card I ran through the cuttlebug using the snowflake embossing folder. Can't wait to get my hands on the new embossing folders! I also made this card for the PaperTake Christmas Card Challenge. 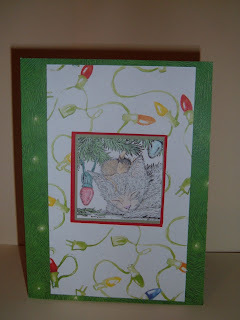 The challenge at Papertake was Cool Yule, make a Christmas card. I had this house mouse image for the longest time but never used it. It's an okay card, nothing specular or wow about it but its kind of cute. The paper I had in my stash forever so sorry don't know who it is from. Finally this is going to be our nieces birthday card. She will be 3 on the 25th of this month. Cinderella was made using the Happily Ever After cartridge. I covered her slipper in diamond stickles. There is a sparkle by her hip in the picture here but rest assure there is nothing on the actual card I examined it real good, so it must be from the flash. 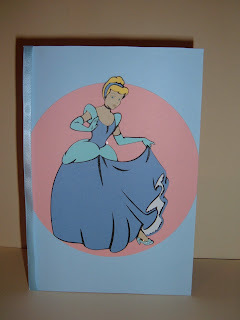 I still need to come up with a cute princess birthday saying for the inside. I was thinking about stamping Happy birthday under Cinderella (in the blue part) but then thought nah.